if you want to flash your Samsung Galaxy J7 Prime (SM-G610F) phone with stock ROM. So you are in right place. Here you will find stock ROM & tool download link. If your phone has issues, like- hanging, phone stuck in the boot loop (Hang On Logo) problem or unfortunately error comes again & again. So this flashing guide will help you to install stock ROM in your device. In this flashing guide, I am gonna teach you. 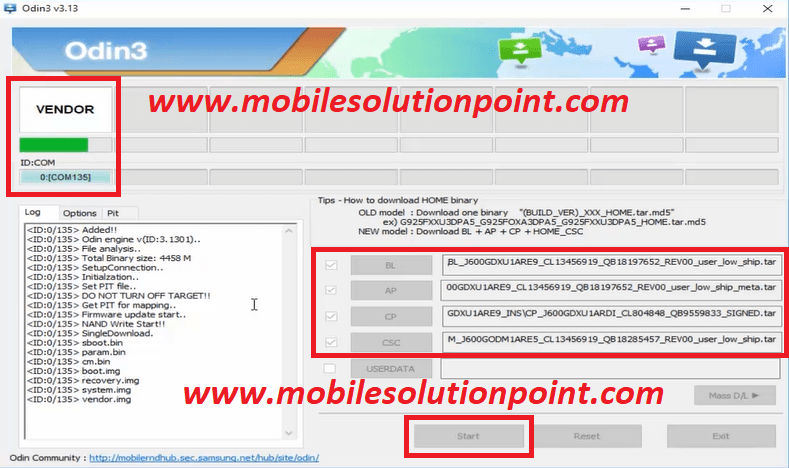 How to install stock firmware in Samsung Galaxy J7 Prime (SM-G610F). And How to fix the software issue of your phone. Now Samsung Galaxy J7 Prime (SM-G610F) has been done updated on new (Oct 2018 security Patch). First, Download Flash File and Tool From the given download link below this post. Download Stock Rom File (G610FDDU1CRJ4 INU.rar). After successfully download the file & flashing tool extract them. Now put your Samsung Galaxy J7 (SM-G610F) phone in download mode by pressing Vol- Key + home button + power Key simultaneously. If your computer is asking for drivers. So download the drivers from the link given below. After successfully connected your phone to the computer. Now open (Odin3 v3.13.1.exe) which is are in (Odin3_v3.13.1) folder. After opening Odin. Select 4 files from the (G610FDDU1CRJ4 INU) folder. Then click on the start button. See the image below.